Acer rubra, Aronia prunifolia, Betula pumila, Ilex verticillata, Larix laricina, Rhus vernix. Closer to open water found with Andromeda glaucophylla, Drosera rotundifolia, Dulichium arundinaceum, Osmunda regalis, Potentilla palustris, Sarracenia purpurea, Vaccinium macrocarpon, Vaccinium oxycoccus. Circumboreal; in North America south to NJ, OH, northern IN, northern IL, and in mountains to NC. 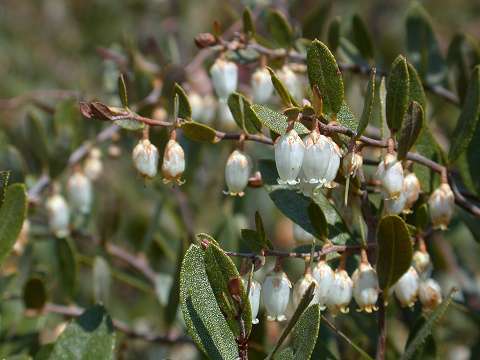 Multi-stemmed, evergreen shrub to 1.5 m. Leaves leathery, green, dotted with round scurfy scale, turning bronze with age. Flowers white, bell-shaped, in one sided racemes. A circumpolar species. Develops a bronze to reddish coloration in fall. Can dominate the shrub zone of bogs and in some cases cover the entire area of a bog. The coloration of a leatherleaf bog is an interesting purple-green.